I have narrowed my remaining Fall/Winter wish list down over the last few weeks. The BIG coat choice remains elusive (I know I want a couple blazers/jackets but those fit into a different category in my silly brain!). I have shown you the 'trench' lusts here. However I am now drawn to the leather jacket camp - quite strongly I might add! Here are two of lovelies I have been looking at (there are quite a few others!!!)! 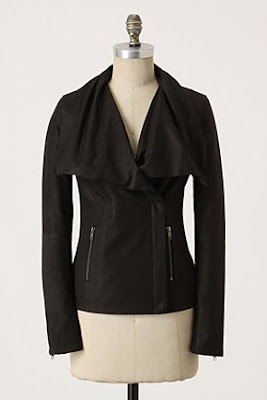 The first is divine but waaaay outta this girls budget, the second is so untraditional for a leather jacket which has drawn me in! now do you go with a traditional classic style or something still classic but with a twist? Oy vey the choices and options! Where did you find a great Leather jacket? Do you have one - do you love it??? Actually I found one last year I think by Vince, but didn't pull the trigger, of course I regret it! I got a leather jacket several years [a couple years ago?] from H&M. It's black and banded at the waist, which I don't really like anymore. Now, I want a rich brown leather jacket and have yet to find one that'll suffice in my price range. I say with real leather jackets, go for classic. Unless the twist isn't trend-centered, otherwise you'll get sick of it eventually. OMG I love that Anthropologie jacket!! I have one from BCBG that I got from a friend. She was in love with it too, but the only size left was one 2 sizes too small, but she didn't care, she bought it anyways, then later decided it was best to give it to me. Yay! Oh man! How do you choose?! They are both amazing! OhMYGosh!!!! thatsecond jacket is nothing short of amazing!!!!! I think traditional is best, you can't go wrong with it! I absolutely love my Joie leather jacket. They both rock! I have that Anthro one and it is amazzzzing! It's so soft and drapes perfectly!!! I too am on the leather jacket quest! Love the j.crew one but a bit much for J.crew don't you think?! BB Dakota has a cute one that is very reasonable on shopbop! I have a leather jacket that I love. I got an amazing deal on it, but it's not vince. Ooooh, I love that second one!